The Bösendorfer catalogue of serial numbers indicates that this piano was built between 1841 and 1850. The piano bears the seal of Emperor Francis Joseph I, ruler of Austria from 1848-1916, which suggests that it most likely was built after 1848. With its original ivory keys and action, it is an exquisite example of 19th century Vienna’s elegant and tasteful design. It has a warm tone and light action. This piano is most appropriate for the advanced collector. This rare Bösendorfer was built a quarter of a century before Henry Steinway revolutionized the piano world. Composers such as Mozart, Haydn, Liszt, Schubert, Brahms, and Beethoven all played and composed on pianos with an action similar to that of this instrument. The straight strung plate design, exposed damper rail above the strings, and rosewood case with Hepplewhite-style legs all attest that this piano is a true masterpiece of old world craftsmanship. This particular Bösendorfer grand piano is an historically significant instrument with a noble provenance. History and mystique surround the first known owner: Marie Alexandrine Freiin von Vetsera, daughter of Baron Vetsera and Helene Baltizzi. During her brief life, Mary (as she was also known) was distinguished by her relationship with Crown Prince Rudolph Hapsburg who, in 1889, committed suicide at Myerling. Mary either took her life or was murdered by Prince Rudolph. Prince Rudolph’s death left the Austrian empire without an heir; thus ended the rule of one of the most important European dynasties. After Mary Vetsera’s death, the piano was eventually purchased by Richard Mazur, a wealthy businessman who presented it to his fiancé, Josefine Kren geb Wagner. Josefine passed it to her daughter, Erna Konkoly, also known as Lyn Astor, a well-known Austrian actress who is the mother of the present owner. 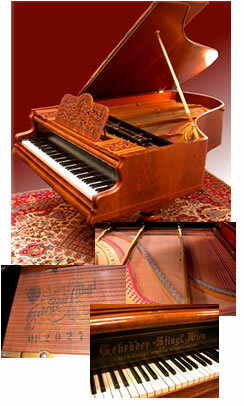 This Bösendorfer was appraised by a world renowned registered piano technician (RPT). Additional information and purchase price available upon request. Copyright 2005-2006 Sloans & Kenyon Auctioneers and Appraisers ALL RIGHTS RESERVED.